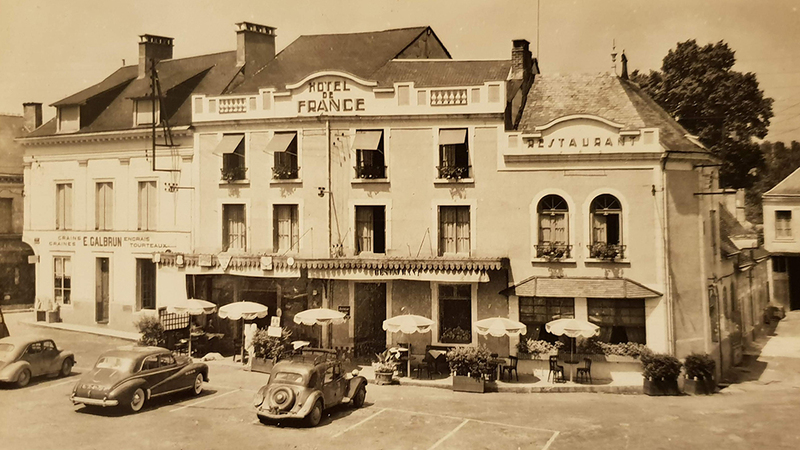 There’s a little town 50 km to the south east of Le Mans called La Chartre-sur-le-Loir which has a delightful square on which presides a hotel called Hotel de France. In The UK, or rather on the world wide web, there is an online forum on the Pistonheads website where those of us without anything better to do stare at old photos trying to identify old automobiles. This one came up recently with the interest being the small fastback coupe nearest the hotel. The thread started in June 2018, is still active and so far the car remains unsolved in my opinion, though some readers have proffered opinions. I certainly don’t know what it is. However, what caught my attention was the scene in general because I have another postcard of the Hotel de France. Mine is unposted though someone has scrawled 1957 on the back with a very flamboyant French 7. I have a mystery car too, though I’ve almost got it. The four circular air vents in the front wing immediately tell us it’s a Buick. It’s post war, probably late forties, so my guess is a 1949 Buick Roadmaster. However, the lights are different to any Roadmasters I can find a picture of and when I do find one that’s similar, it doesn’t have the four vents. So am I barking up the wrong tree? I also find it odd that it’s Right Hand Drive and what does that very long registration number signify? I think ‘ll pass it back to the Pistonheads forum and see what those guys make of it. If you know, please post a comment. As a start: 6735 AH 75 is (or was, I’m afraid) a regular French registration, part of the long-lived system which has been replaced by quite a different one, lately. The last digits referred to the district the vehicle had been registered; in this case Paris. The four air vents (I remember such things being new for sale at garages) can be either real or just for show. So they don’t give a reliable clue of the car’s make. The beautifully styled body has an Italian or a French appearance. If not, a Swiss or a German design could be possible, but surely no American origin. The right hand drive refers to something Italian, like sports cars built in that country still had during the early fifties. I regret I don’t recognize the wheels, or the badge on the bootlid, at first sight. If my eyes still do their job, the louvres in the bonnet will possibly be of help when starting my real search. Nice subject !!! I’ve sent the photos of the mystery car to my best fellow-hobbyists/collectors. Latest news: it’s a 1949 Delahaye. Body possibly by ‘Letourneur et Marchand, Carrossiers Paris’. But I’m not yet quite convinced of this firm, because of different styling details. By the way: porthole-Buicks had three of those air vents. I’ll keep my eyes open. Anyway: rare beast, lucky photographer! Thanks Rob. Good guess but not quite right. Someone else has identified it as a Salmson G72 ‘Randonnée’. I’ll post more tonight. Best wishes, Bob.